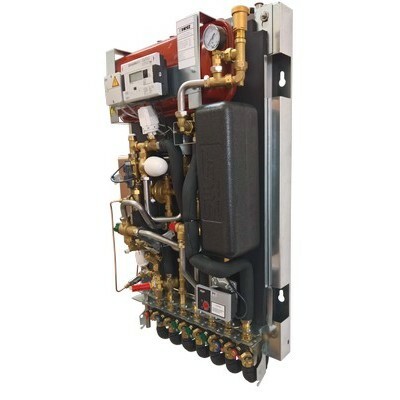 The Guildford Indirect HIU (Heat Interface Unit) from Herz is suitable for all community schemes and enables LTHW from a central plant to provide heating and DHWS to each dwelling with complete hydraulic separation between the LTHW primary and secondary heating and DHWS systems. The primary flow to the heating system heat exchanger is controlled by a two port on/off actuated valve linked to a programmable room thermostat (Herz 3 F799 17). This valve will close when the room temperature setting has been achieved or when the heating system is not in use. A fixed spring differential pressure control valve is fitted across the primary flow and return circuits on each HIU to protect the control valves from excessive DP. The secondary heating circuit is provided with an expansion vessel and secondary domestic heating pump which varies the system flow rate automatically based on demand. DHW temperature and primary flow rate through the heat exchanger is controlled via the Pressure temperature control valve, which is temperature compensated and requires no auxiliary power to operate. When the hot water demand ceases the pressure temperature control valve will immediately stop the primary flow into the heat exchanger. Therefore there is no drain on the primary heating when there is no demand, so no “extra energy usage” when residents are on holiday for example. 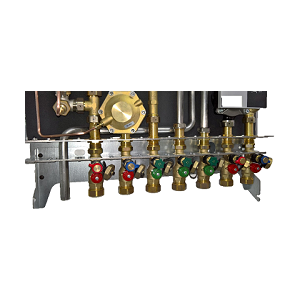 A tempering valve is provided to counter the effect of temperature overshoot caused when a hot tap is closed and opened again in a short space of time, this also ensures a stable output temperature. A thermostatic “summer” bypass valve is fitted to maintain a minimum primary temperature when the space heating is not in use. This provides a quick DHW response and avoids unnecessary energy usage. As a hot water tap is opened the pressure temperature control valve reacts to the difference in pressure via a diaphragm and opens allowing the cold and primary heating water to flow through the heat exchanger. 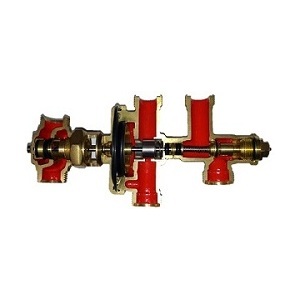 At the same time, a hot water priority valve closes the primary feed to the secondary heat exchanger, thus ensuring maximum flow is available at the domestic heat exchanger. In order to prolong the life of the DHW heat exchanger and prevent lime scale build up, the temperature of the domestic hot water is controlled by a thermostat fitted to the pressure temperature control valve. Using an immersion sensor, this thermostat controls the temperature of the hot water that exits the heat exchanger and regulates the pressure temperature control valve thus maximising the energy efficiency of both the HIU and the primary system. The ”Summer bypass” valve utilises a return temperature limiter head fitted to a thermostatic valve installed in a bypass between the primary flow and return pipework within the HIU. This maintains a minimum primary temperature when the space heating is not in use. 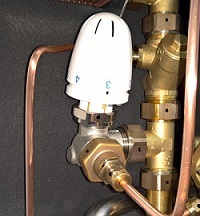 The thermostatic bypass valve is installed upstream of the heat meter. Combined with the Pressure Temperature Control Valve, which only allows water through the DHW heat exchanger when there is a demand, ensures that it is impossible to have meter creepage or standing losses from the Herz Guildford HIU. The secondary flow temperature is controlled by a thermostatic valve installed in the primary return, this is fitted with a thermostatic head with a contact sensor attached to the secondary flow pipe. 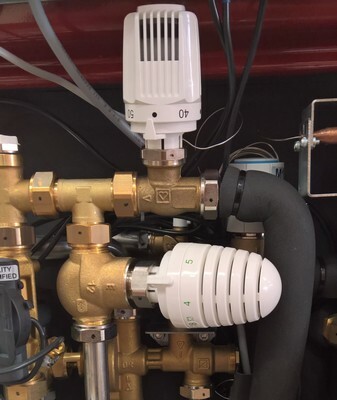 The Herz Oxford HIU can be fitted with a Herz HIU flushing bypass, this is a custom made valve designed to facilitate the flushing of the primary system without the water circulating through the HIU as recommended in BSRIA Guide BG 62/2015. 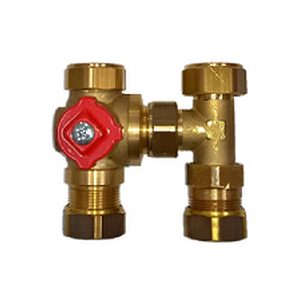 The flushing bypass valve can be connected directly to the HIU ball valves at first fix so that primary flushing can be carried out before the HIU is fitted. The Guildford HIU has the option to have a stand-off bracket installed to enable the services to be connected from the top of the unit. The top entry stand-off bracket enables any combination of services to be piped from above or below the HIU. Pre-formed, pre-insulated pipes, complete with all connections, are available to provide full flexibility.